Although it's still 70 in PA, the weather is definitely cooling off and the leaves are falling, putting me into fall mode. At brunch this weekend I ordered pumpkin pancakes with real maple butter and maple syrup, and that's when you know it's real: fall has arrived. 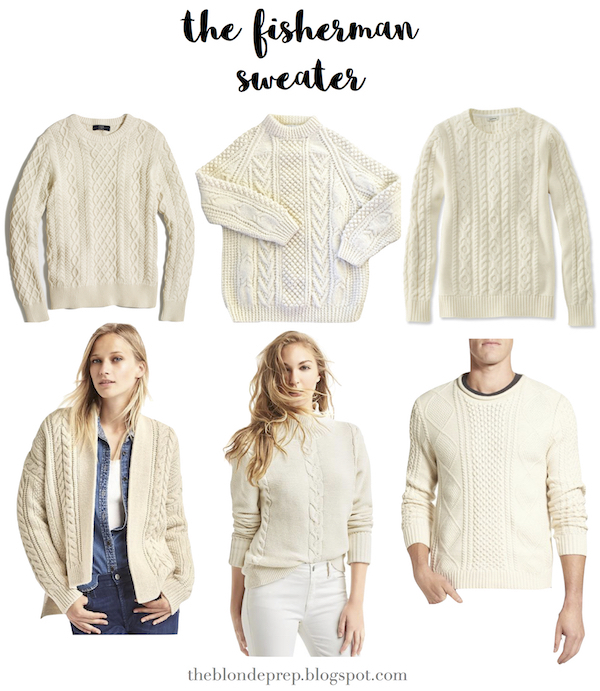 The Fisherman sweater is a classic cable-knit staple in a preppy girl's (and guy's!) wardrobe during the chillier months of the year. The best part about fall, to me, is bundling up in classic and cozy knits and layers and looking good while also being comfy. Does anyone else agree that it's so easy to be comfy and cute in the fall?! Leggings, bean boots, a sweater and a jacket and you're set. The best part about the Fisherman sweater is that it can easily be one of the most versatile pieces in your wardrobe. Wear it alone, over a flannel, under a Barbour, or with a baseball cap and leggings. Seriously, you can't go wrong! I love how easy it is to pull of a men's version or vintage option too. Classic. What do you think of the Fisherman sweater? I love a good fisherman sweater. Even though they look all the same, for some reason I have 5 and wear them all in different ways! I loved all your picks! I don't own a fisherman sweater, but I'm seriously thinking about purchasing a good one for this fall! I love the cardigan version, it looks so comfy!